I just love my Yard Machine. When I had to buy a new mower, I knew that I had to buy one that was going to last. I was a little hesitant at first to buy this mower, only because I was not that familiar with the brand name. I went ahead and bought it. It was a very affordable mower compared to the other mowers on display. It came in a box and was very easy to put together. All I had to do was attach the handle and the wheels to the mower. It also came with its own bottle of oil. That made it easy to figure out what type of motor oil it takes for future use. It also came with its own tool to assemble the parts together. The mower has an easy pull starter. With just one pull, the mower starts. My yard is about an acre, and I can push my mower and get the yard done within an hour. 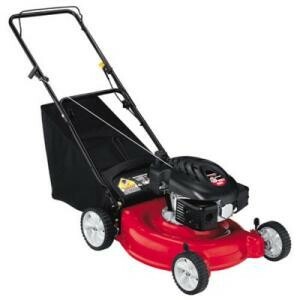 It is very light weight and it will cut the grass as fast I can push it. The bag on the mower is also light weight. It is very easy for me to remove it from the mower. The grass comes out with just a little shake. Most mower bags you have to shake up and down several times to get all of the grass out, but not this one. Putting the bag back on the mower is also a snap. I love my yard machine, that I bought one for my family and reccomed it to all of my friends.